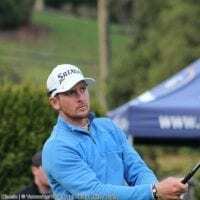 VANCOUVER GOLF TOUR & VANCOUVER PARKS GOLF announce details of 12th Annual JOHNSTON MEIER INSURANCE Vancouver Open and MAUI JIM Charity Pro-Am. The Vancouver Golf Tour and the Vancouver Park Board are pleased to announce the details of the upcoming 2018 JOHNSTON MEIER INSURANCE Vancouver City Open and MAUI JIM Charity Pro-Am for the FIRST TEE. With a full field of 224 players & full Pro-am, this year’s total purse is projected at $90,00 in cash and prizes with a $10,000 FIRST PLACE cheque to the Champion! 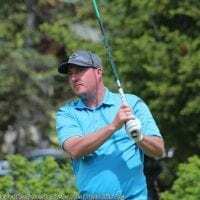 On August 29th at 1:00pm the MAUI JIM Charity Pro-Am presented by TRAVIS MATHEW Clothing will take place at Fraserview Golf Course and feature four amateurs playing with a top Professional from the Pacific Northwest. The teams will have the best two scores out of five count on each hole in a team “shamble” format. The Pro-Am will include over $30,000 in amateur tee-gifts and prizes plus a chance to shoot out for a $1MILLION HOLE-IN-ONE at the end of the day. The Pros will compete for a $5,000 pro purse, and the Pro-Am will proudly benefit the FIRST TEE of Greater Vancouver YMCA. The 54-hole JOHNSTON MEIER INSURANCE Vancouver Open presented by ICBA BENEFITS will begin on Friday, August 31st at 7:30 am. The tournament is a 54-hole stroke play championship for all players. Competitors will rotate between McCleery and Langara Golf Courses for the first two rounds, with a cut coming after 36 holes to the top 70% of Amateurs + ties, plus 60% + ties for Professionals. 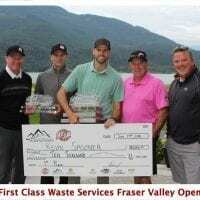 The final round will be completed at Fraserview Golf Course on Sunday September 2nd beginning at 7:30 am with the tournament leaders teeing off at 2:00 pm to determine the 2018 Vancouver City Open Champion. The Vancouver City Open is open to all Professionals and Amateur golfers with a registered GOLF CANADA or USGA Handicap Factor of 18.0 or less. While the Pro-Am allows amateurs with a handicap of 30.0 and under to play with a top Pro for the day! Spectators are welcome and admission is FREE. Donations will be accepted at the gate all 3 days with proceeds going directly to the FIRST TEE. All information and online entry for both events are available on the Official Van Open website: https://VancouverOpen.ca. “This tournament is a great showcase of our top local and Pacific Northwest talent”, stated Fraser Mulholland, Commissioner of the Vancouver Golf Tour. “We are extremely proud of the Champions the event has crowned, including 3-time Champion Adam Hadwin, 2012 Champion Eugene Wong, local Club Pros Phil Jonas (2007) and Bryn Parry (2009) and our reigning Champion James Allenby who capped off an amazing 2017 season with 6 tournament wins and a 66.8 stroke average. And for the weekend warrior with a slightly higher handicap, this too is THEIR MAJOR where they can shine within their own handicap division to bring home the trophy! For the first time this year’s Vancouver Open event will feature a Senior Amateur Title (55+) and Women’s Open Championship. Full details of the Vancouver Open Championship can be found by visiting https://vancouveropen.ca. Vancouver Parks Golf is made up of the Fraserview, McCleery and Langara Championship Golf Courses and Queen Elizabeth Park, Rupert Park and Stanley Park Pitch & Putts. The championship golf facilities offer a wide range of options for golf tournaments, corporate meetings and special events and receptions. The Pitch & Putts are great for the beginner, all ages or for those who just want to sharpen their short game. Great affordable golf is within easy reach. Vancouver Golf Tour (VGT) has been developed for our local Professionals and Amateurs – giving them the opportunity for a high level of competition in a PGA Tour environment without spending excess travel dollars. VGT has been designed to give its local players the opportunity to learn how to win while at the same time building their confidence to play on Worldwide Major Tours. Johnston Meier Insurance Agencies Group is a locally owned and operated insurance brokerage that has grown from a single site, established in 1973 in Maple Ridge, BC to over 46 locations throughout metro Vancouver and British Columbia. Based on the simple principle of putting customers first and letting the business take care of itself, JM Insurance is now one of the largest insurance agencies in the province and still growing. Their team of insurance professionals in both personal and business categories has a reputation for providing best in class service that saves you, our customer both time and money. The First Tee of Greater Vancouver is the only First Tee program in Canada. An initiative of the World Golf Foundation, First Tee has its mission To impact the lives of young people by providing learning facilities and educational programs that promote character-development and life-enhancing values through the game of golf.